It’s time to announce the launch of another brand-new book. What could it be? In this episode of The New Music Industry Podcast, I share about Start Your Year the Right Way, who it’s for and how it’s structured. I also read the introduction. Maybe you were expecting it. Maybe you weren’t. 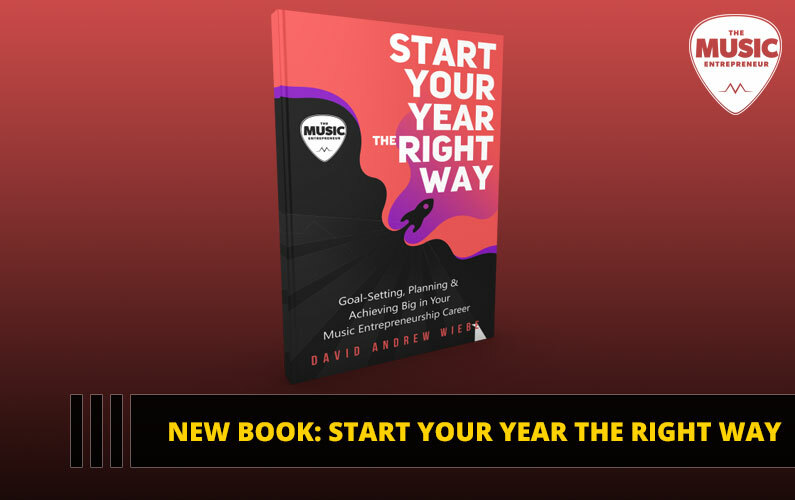 Either way, it’s here – the new book, Start Your Year the Right Way: Goal-Setting, Planning & Achieving Big in Your Music Entrepreneurship Career. You might recall that I hinted about this book in episode 94 of the podcast. That was almost a year ago now, so of course there’s the possibility that you don’t remember. Now, if everything had gone according to plan, I would have launched this book in January or February. I had to get permission to use some of the content I included in the book, which is why it took a little longer to publish. 2019 still feels fresh to me, even though we’re already into March. I’m up to a lot right now, and the year is going by very quickly. Anyway, my point is that it doesn’t matter when you pick up and read the book. If you’re having a great year already, you can use it as a springboard onto bigger and greater things. If you’ve starting to lose your steam, then you can use it to reset and set yourself up for an effective 2019. If you’d like to check out the book now, just go to musicentrepreneurhq.com/year. That’s musicentreprenuerhq.com slash y-e-a-r. You’ll be brought to the book’s Amazon listing. And, of course, why wouldn’t you want to check out this book? You need it. Just so you know, this book is a journal and workbook as much as it is a content-driven book. So, it’s for those who want to take some time to think and reflect on the year they just had and what they’d like to accomplish in the year ahead. What I’d like to do now is read the introduction for you. I hope you enjoy it, and thanks for your consideration. At the outset, I want to point out that this is a different kind of book. I know that may sound a bit ominous, so let me clarify (don’t worry, you didn’t buy a weird book by accident). Every year, on The Music Entrepreneur HQ (my online business), I publish a series of posts to wind down the year past and clear the way for the year ahead. I affectionately call this our New Year Content, which is typically comprised of several blog posts and podcast episodes, and sometimes videos too. At first, it wasn’t anything spectacular or out of the ordinary. I shared a post or two about goal-setting and productivity and went on my merry way with publishing relevant content for my audience. But as the years progressed, I started adopting more processes and habits that my life now revolves around. It’s become hard to imagine not following these New Year rituals now. They’ve become a part of my DNA (and my business’ DNA too). From closing the chapter on the past year to setting theme words for the New Year, these processes have brought a lot of clarity to my world. They’ve helped me reflect on what I’ve learned and achieved, unload baggage from years past and set my intentions for the year ahead. It sounds simple, but the results have at times been surprising and even miraculous. And, with more processes and habits came more blog posts too. I started publishing more New Year Content to help people like you achieve clarity around your goals, be more productive and stay motivated throughout the year. Motivation is important. But we all need access to something more than the hype-based rah-rah motivation which doesn’t last. Let’s face it – the entrepreneurial journey isn’t always easy. Challenges can come in many forms. And, it’s essential to build a strong mindset and find motivation and fulfillment in the work we do. But there is a solution to all this. Thought and reflection are powerful tools, and I don’t think most people understand their value or tap into their power often enough. Imagine! Spending countless hours at work not knowing whether it has any bearing on your career or business. If that’s not insane, I don’t know what is. I think if you spend more time thinking and reflecting, especially during the week before and after the New Year, you’ll gain a lot of clarity around what to do next to get to where you want to go in your career. By extension, this will also help you progress towards your goals more rapidly. Thinking and reflecting can also help you silence your incessant mind chatter. It can bring peace, calm and tranquility, even amidst the madness you daily encounter in your business. That’s the value of thinking and reflection, and that’s what this guide will help you tap into as you look to do and be your best in the year ahead. It introduces a topic (i.e. theme words, closing the chapter on the year, productivity, etc.). It offers insight into the established topic. It summarizes the topic, so you know how to apply it to your life and what to do next. It prompts you with important questions or asks you to walk through an exercise. This is how every chapter is set up. So, what you hold in your hands is a journal and a workbook as much as it is a guide. There are valuable insights contained within. But the greatest value you derive from this book will come from the effort you invest in yourself. You see, only you know what matters to you. I can’t tell you what goals to set or how to reach them. But I can offer some tips on how to set yourself up for a great year. If you didn’t have a great year, you’re probably going to want to make this year count. And, if you did have a great year, you’re probably going to want to figure out how you can have another great year. Honestly, I’ve come to the point where I don’t believe in good years or bad years anymore. There are only years. And, thinking that way has served me well, because it leaves space for great things to happen in the year ahead. After all, I’m looking to create something new. I’m not interested in rehashing the old. The best way to start a year is to start it with a clean slate. I can’t do that if I carry last year’s baggage into the New Year. Now is your time to consider or reaffirm what’s important to you. It’s time to look ahead and decide what you want to accomplish. It’s time to plan and figure out the steps you’re going to be taking to reach your goals. Don’t worry about what didn’t happen last year or the year before. Get complete with it. Whatever happened, happened. What didn’t happen, didn’t happen. Whatever you did, you did. Whatever you didn’t do, you didn’t do. This is a New Year. Start it fresh. Embrace new possibilities. Also, it doesn’t matter when you’re reading this, whether it’s at the dawn of another New Year or smack dab in the middle of the hottest days of summer. Forget yesterday. You can start fresh now. You don’t need to wait for another year to arrive. Approach the New Year with a clear mind and clear heart.